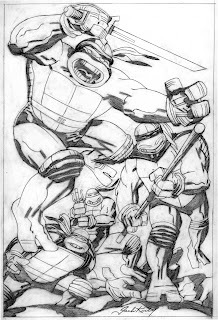 Peter Laird's TMNT blog: Blast from the Past #50 repost: TMNT as drawn by Jack Kirby! One of the things that I LOVE about the Internet, is that we can post just about anything faster than the studios can release it on DVD. Is there any way you could get permission from Steve, and a copy made of that rough tape to bring to Comic con, so we can post some of this stuff online? I'm not talking about posting all of it, obviously....but just some of it as a quick 3 minute 'teaser'. Sort of a 'Hey, if you want Warner Brothers to release a Special Edition, contact them here to see more of this stuff..' type of thing. It's better than a petition, because if WB sees about 500,000 hits on an un-advertised piece of video, that'll show up as 500,000 sales in their mind and maybe it'll get something rolling. -->> ..Not ever a waste of time ..
..f8ck, Pete .. Neil .. this news totally rocks..
..Pete don't forget tho' .. The Kings contribution on **Turtle Soup # 4 !! .. a nice bright patch of good news !! And i've been waiting for this larger scan of Jack's forever !! -->> ..o god that scan is so beautiful. Damm look at that detail. And I I'm still waiting for that TMNT special edition dvd... along with every other TMNT fan in the world. You, Kevin Eastman, "The King", and Steve Barron all simultaneously rock. 1. Is this NEW TMNT comic, a new comic in Volume 4 or the re-released of the classics you were redoing? 2. Wouldn't it be possible to put the VHS footage on a DVD even if it's not the high quality that the actual film would be? Any kind of bonus footage would be a treat to fans. .. i'm keepin my mouth shut, Neil , Vaughn, Pete .. Easier Done than said with VHS footage :). All you need is a VCR and either a TV Tuner (back in my day, that's how I did it back in 95) or now adays, a DVD recorder. But in this day and age, minus the clean up, with the right voice actor contacts a fan can do all this on his computer, easy :). Mixing different voice tracks, encoding the video, recording the voice actors (if they know how to get in touch with them).. If you guys could bring a copy to NYCC, I could have it digitized and brought back on Saturday with my lap top to figure out what to post to youtube... if you guys are up for it and we can get steve's permission..."
1. Is this NEW TMNT comic, a new comic in Volume 4 or the re-released of the classics you were redoing?" "2. Wouldn't it be possible to put the VHS footage on a DVD even if it's not the high quality that the actual film would be? Any kind of bonus footage would be a treat to fans." I would dare say that the first Teenage Mutant Ninja Turtles movie is a classic masterpiece and should really get a new DVD/Blu-Ray edition that includes lots of bonus materials. IMO, the first TMNT movie was as great as Superman or Batman. It was in the 80s/ early 90s and it's not easy to get all those special effects. The puppets and turtles suits were very expensive and it's something that the new age of movies lacks when CGI is much more common. I'd love to have a deluxe featuring those scenes. Maybe you and Barron could record a commentary too. Looking at the exclusive DVD bonuses that exist these days, it strikes me you could even add an incentive bonus with the right contracts, including a different exclusive figure variant or poster at certain stores. Online casinos on mobile easily.